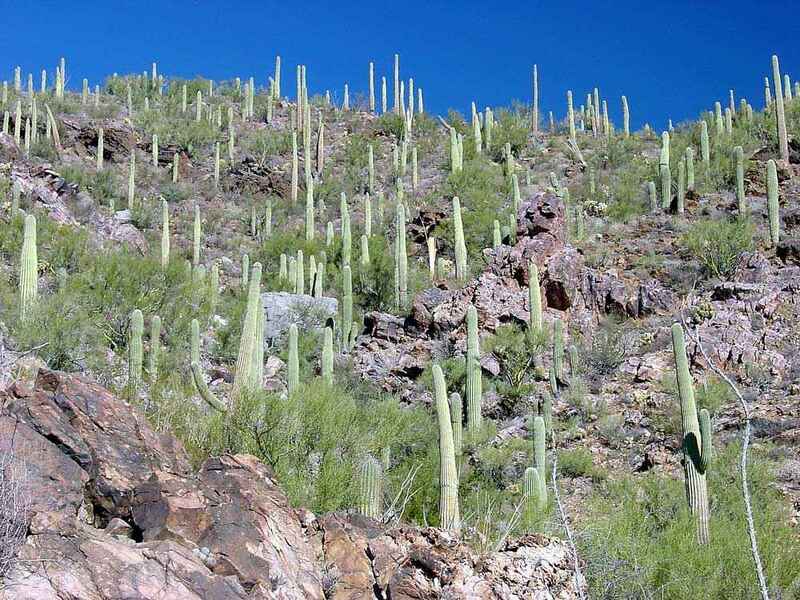 View of the Waterman Mountains from Waterman Pass to the south. View of the Waterman Mountains from the Roskruge Mountains to the south. 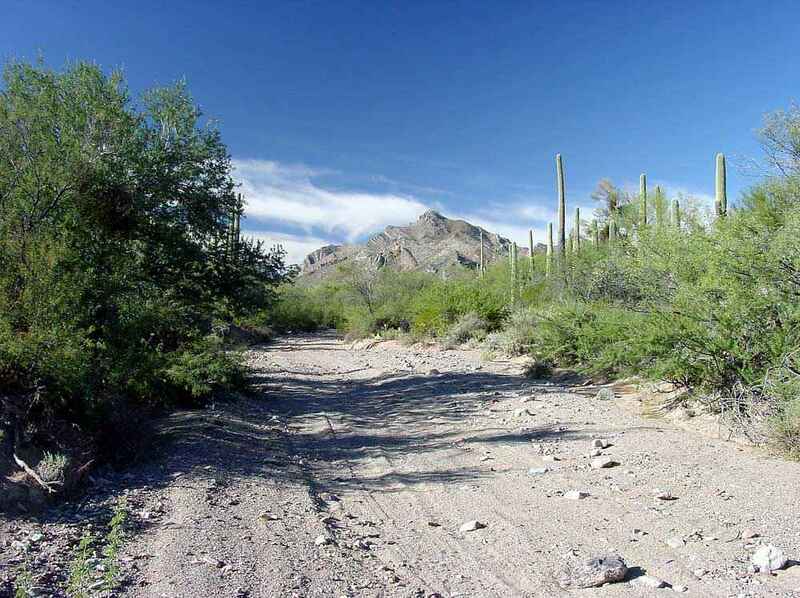 The scar is the Silverhill Mine road (now impassible). 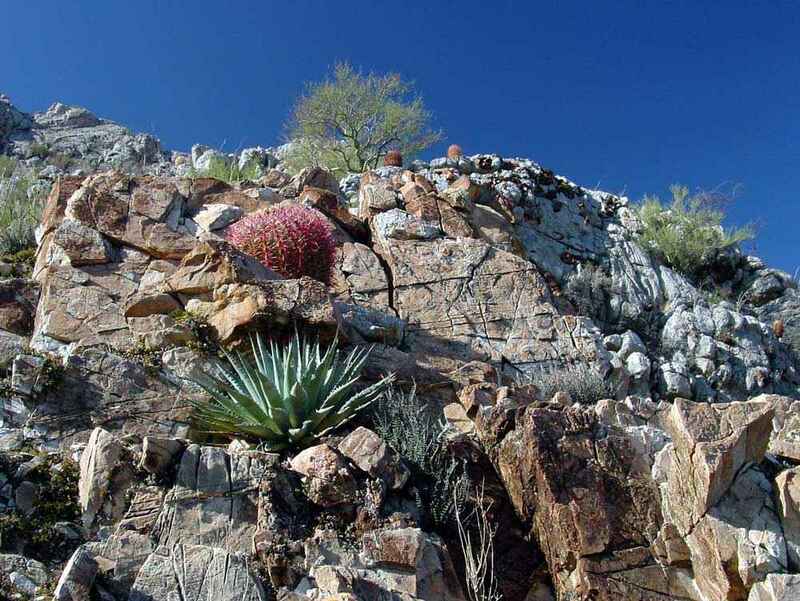 Above: Succulents such as fire barrel cactus (Ferocactus cylindraceus), desert agave (Agave deserti), and elephant tree (Bursera microphylla, not present in these views) are common on the limestone slopes. 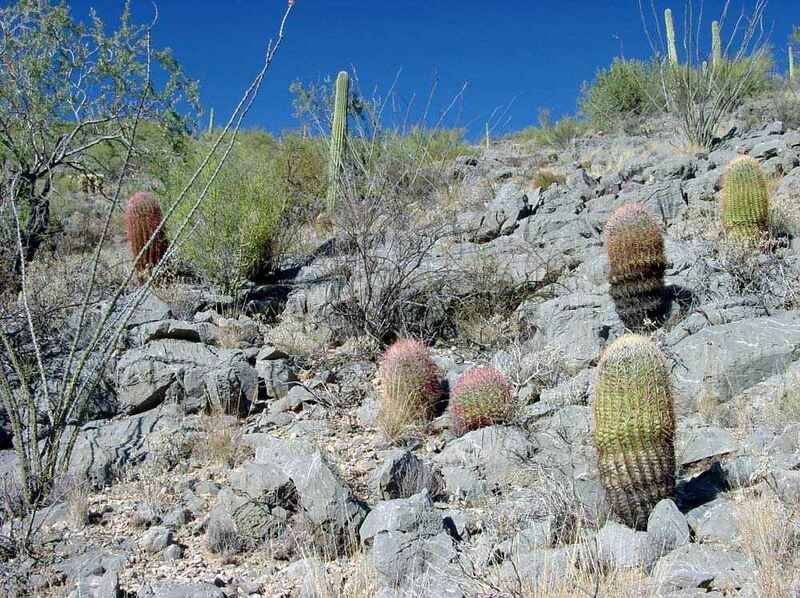 In contrast, saguaros do not grow well on limestone and are therefore uncommon in most of the Watermans. 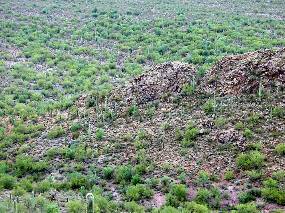 There is a major outcrop of Abrigo Sandstone on Waterman Peak. 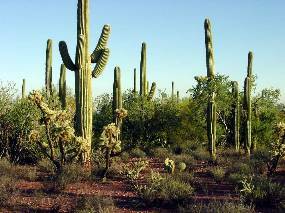 Saguaros grow thickly on it. 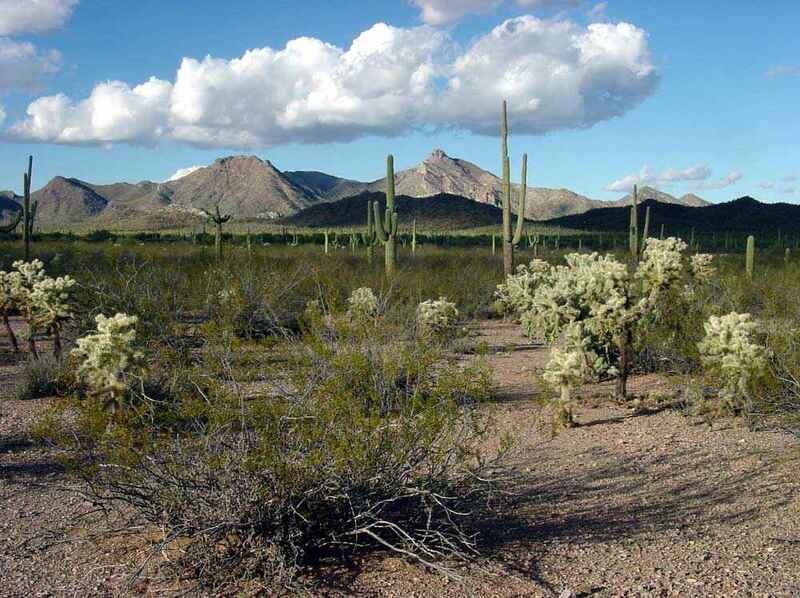 View southeast down a spur of the Waterman Mountains across the small Pan Quemado Mountains to the Tucson Mountains (Saguaro National Park and the Desert Museum) on the horizon. 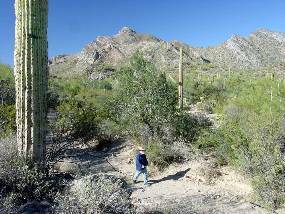 The Santa Catalina Mountains are in the haze at the extreme upper left. 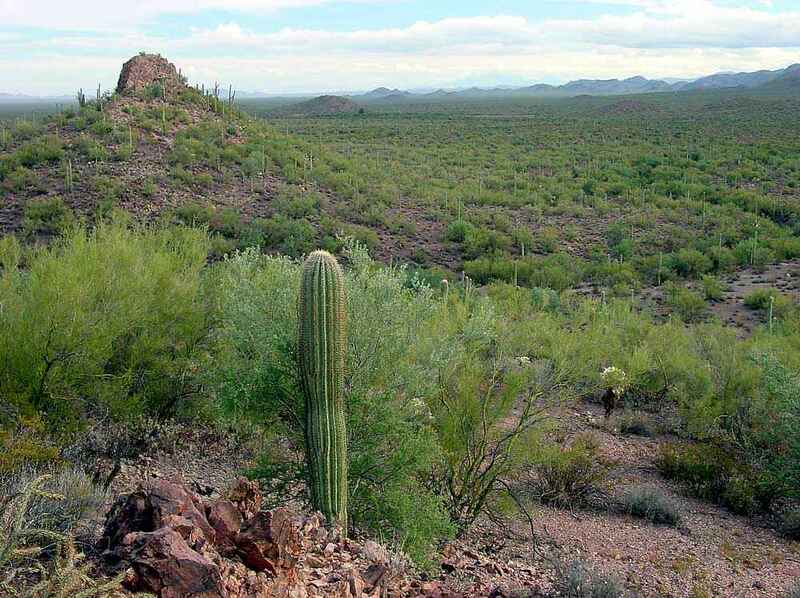 View southeast from the Waterman Mountains. The isolated hill and longer ridge in midground are the southern outliers of the Watermans. 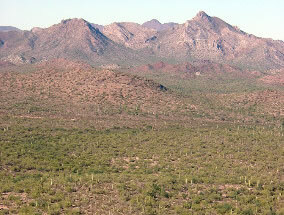 Most of the mountains on the horizon are the Roskruge range. 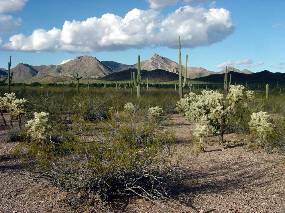 Southern Waterman Mountains with a dense patch of Arizona Upland vegetation on the bajada. Two views of an extraordinarily dense patch of Arizona Upland forest on the south edge of the Waterman Mountains. 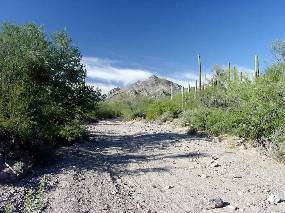 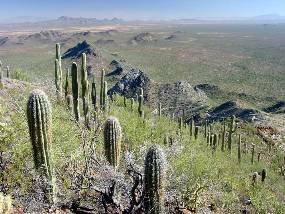 Covering only a few acres of braided wash channels, there are numerous impenetrable groves of large trees and dense colonies of saguaros. 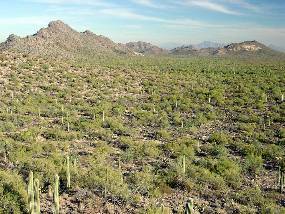 Above left: One of the forest patches on the southern edge of the Waterman Mountains; this one is mostly ironwood trees. 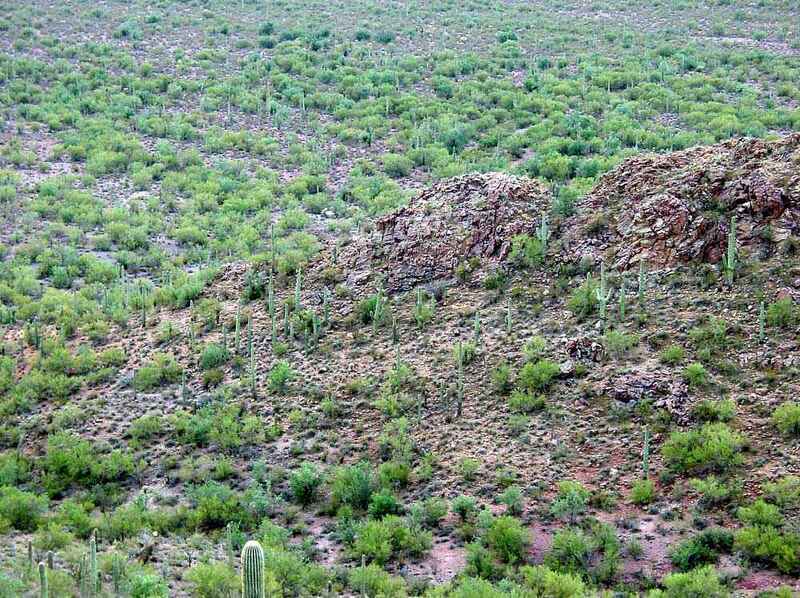 Above right and below: Nowhere else in the range of saguaro cactus have we seen such dense colonies. 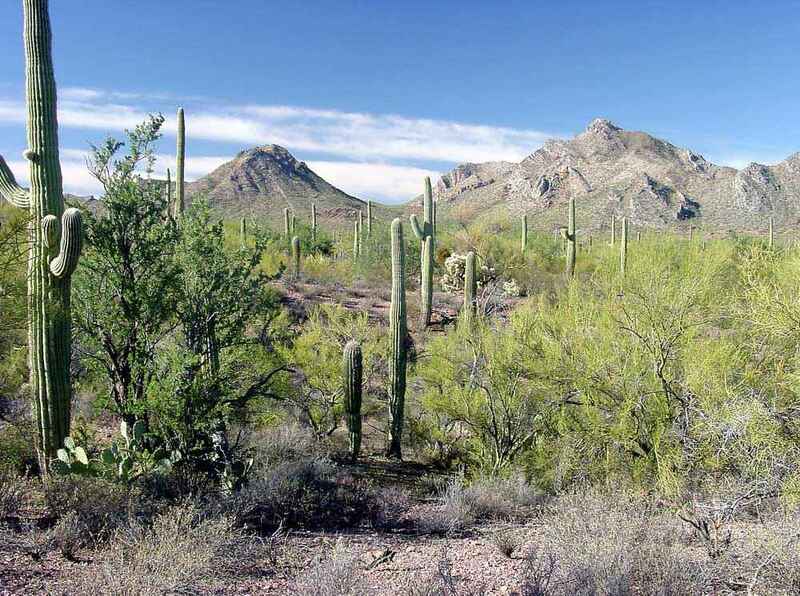 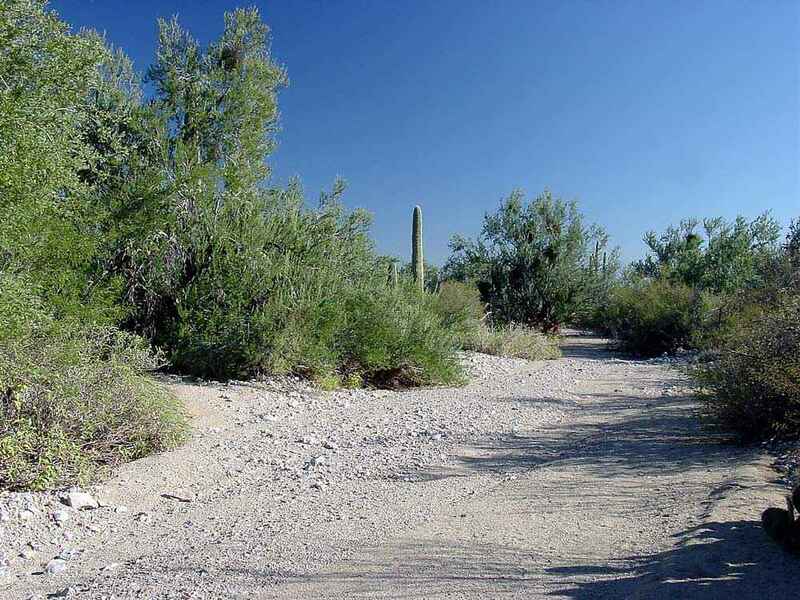 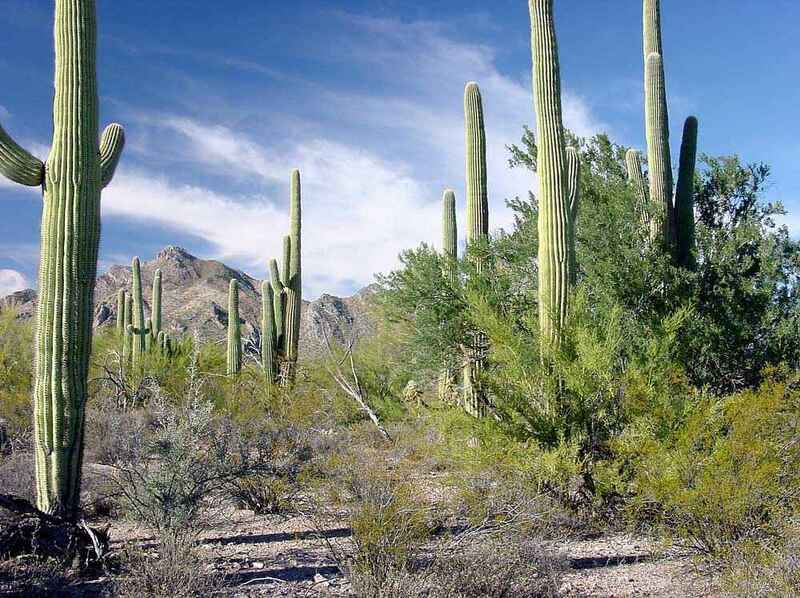 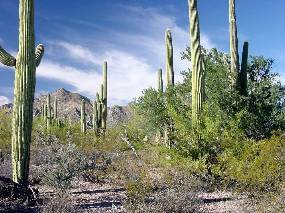 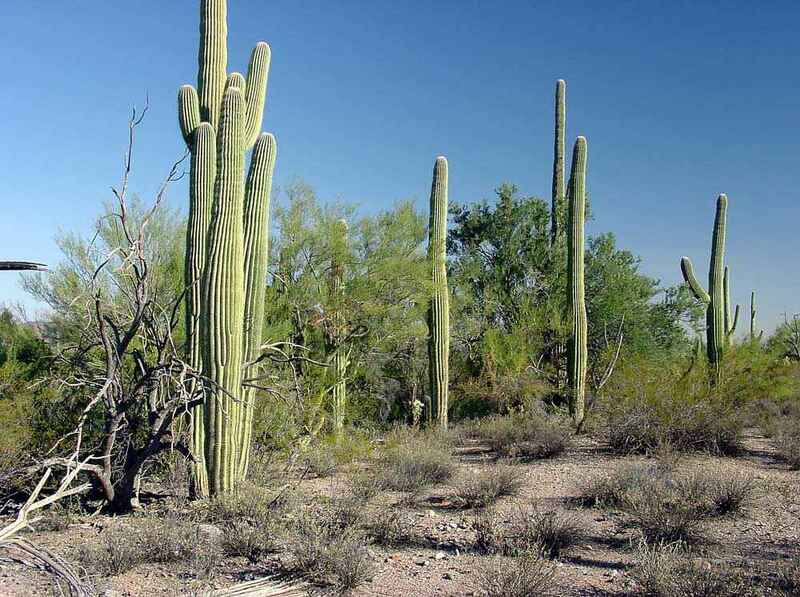 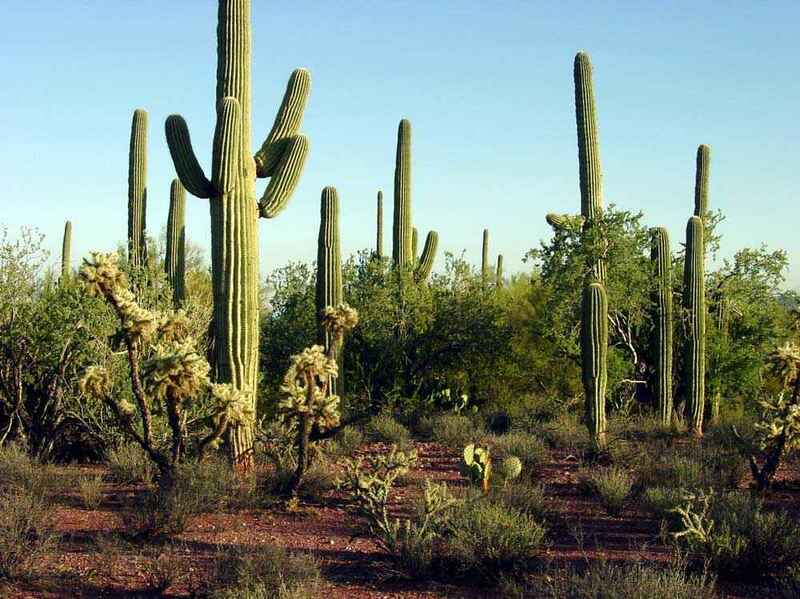 Many of the trees in this small areas support more than 10 saguaros. The palo verde above right has 11. 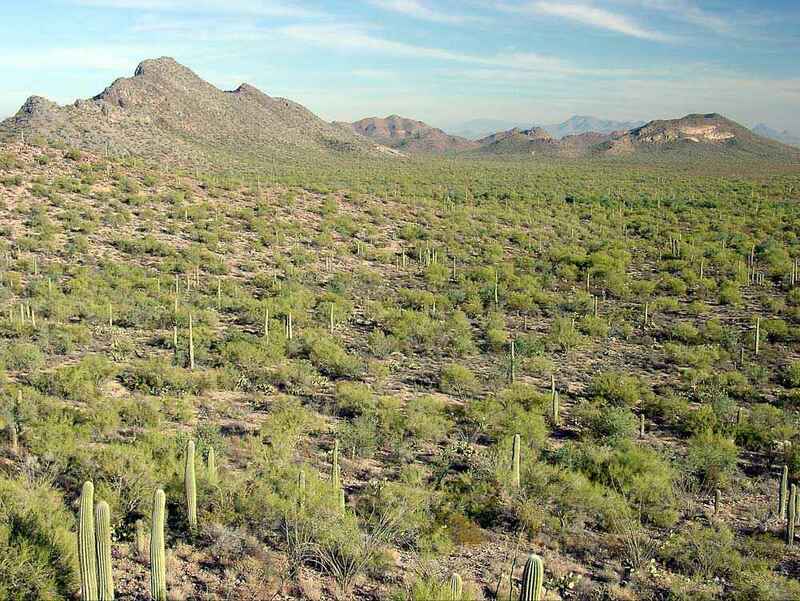 The tight circle of 9 saguaros below left has a dead palo verde inside. 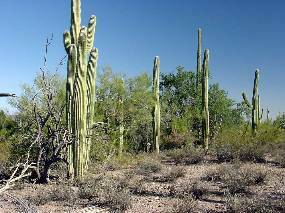 Below right is a grove of 19 saguaros sheltered under three nurse trees, two of which have been killed by their former proteges. 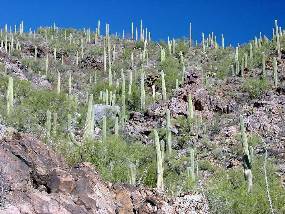 Above: Numerous small washes on the bajadas of the Waterman Mountains support dense ribbons of ironwood trees. 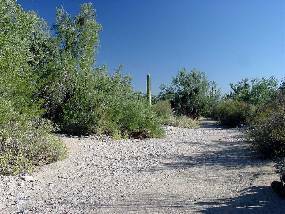 Above two and left: The channels of three washes in the Watermans. 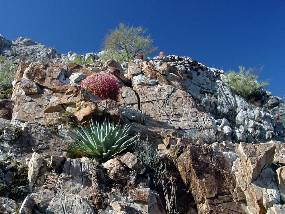 View southeast from a saddle below Waterman Peak. 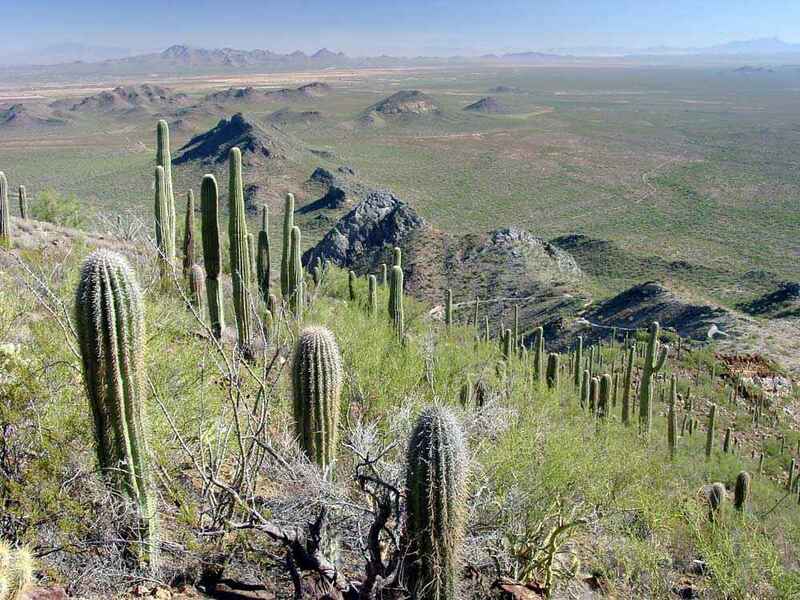 The Tucson Mountains (Saguaro National Park and the Desert Museum) are on the horizon. 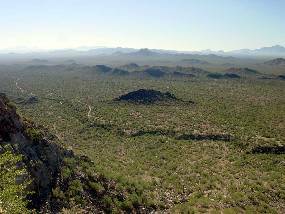 A panoramic view to the southeast from the Waterman Mountains. This valley has an extensive stand of Arizona Upland woodland vegetation. 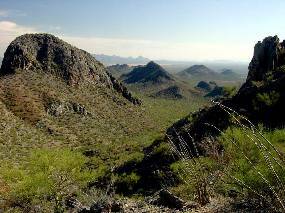 The Roskruge Mountains are on the right. 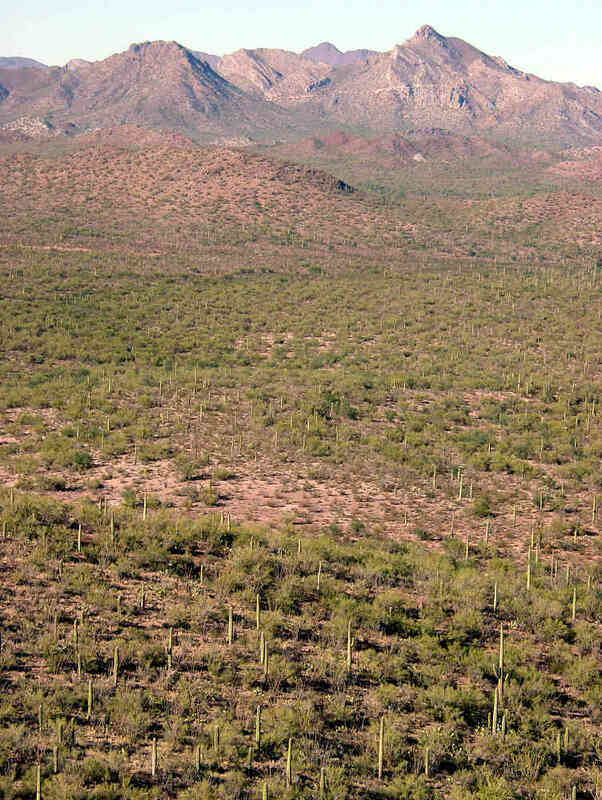 View of the Waterman Mountains from the southeast.